As many of you know these past few weeks of my pregnancy have been very trying for me. It started out when I wound up in the hospital in severe pain. They still cannot pin point exactly what was going on at the time. They said it could’ve been my kidney or a UTI, but all the tests came out ok. I did not show any signs of infection in my urine or blood. But the pain caused me to go into early labor where I was having heavy contractions but my cervix was not opening. I was only 35 weeks pregnant so they wanted to stop the contractions by giving me intravenous antibiotics and fluids. That worked and I was sent home. But the pain continued and I wound up on bed rest. I could’nt sit or stand for too long. The only relief I got was when I laid down. I tried to get my computer client work done, but the longest I could sit at my desk was maybe 30 minutes. I think that was the hardest part for me, not being able to meet my responsibilities. Thank God for my church family though, who really stepped in to help us with meals and getting my 2 older ones to preschool and kindergarten. My mom was a huge help as well when she came to stay with us for a few days in the beginning when I was in the most pain. I begged God to get me through that time and to have favor on me concerning my labor and delivery. I was so scared that I would go into labor and that the kidney pain would return. I also was praying that I would have the baby before Christmas so we could at least be home in time to spend it with our other children. I had an OB/GYN appointment scheduled for the day before Christmas Eve to get my membranes stripped, but I called and asked if they could schedule it for Monday instead even though I was not quite 38 weeks yet. They agreed (THANK GOD!). Anyway, I went in to the office and the doctor did the whole membrane stripping thing which is not that pleasant, but it really does work. After that the doctor told me to stay local and maybe go walk around the mall for an hour and then come back and get checked to see if I was dilating. Well, the mall was not my idea of a relaxed time especially a few days before Christmas and with our 3 hungry small children. It is so cold out though and there was nowhere else to go, so the mall was our only option. Once we got in the car to drive to the mall, I started getting contractions. By the time we got in the mall, they were coming on pretty strong. We got the kids some food and sat down at a table in the food court and we started timing the contractions. Keep in mind that I had only had my membranes stripped about an hour earlier. My contractions were coming on faster and stronger and I told my husband that we had to leave NOW and go straight to the hospital. I knew that the baby was coming and FAST. My husband dropped me off at the hospital and then took the kids home to go stay with a friend of mine who had been planning on taking care of them while I was in the hospital. When I got to the labor room and was checked, I was already 6 cm dilated. I was so scared that my husband would not make it back in time for the birth, so I decided to lay down and try to stop the contractions from coming. The funny thing is, that it worked. The contractions subsided and 2 hours later when hubby finally got to back to the hospital I got up and started walking around. Immediately the contractions came back pretty strong. They were not terribly painful either. I labored for about an hour or 2 and when the doctor checked me I was almost 10 centimeters. They suggested I push through the lip in order to be ready to actually push the baby out. So, at 8:30pm I did that and by around 8:50pm, our baby was born. I did not need any pain meds. The pain in my side was not there. I had the smoothest labor and delivery that any pregnant woman could ever ask for. I only had one moment of excruciating pain when the head was out. The cord was wrapped around the baby’s neck and they had to untangle it. They told me not to push. So that was when I was screaming. But it went by fast. Once the body came out I was instantly relieved. 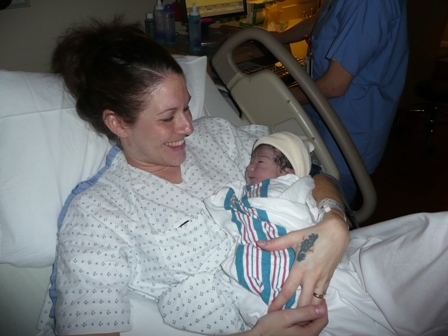 So, here I am a few minutes after giving birth – happy as can be that it was all FINALLY over. And most importantly our new baby was healthy. I do not miss being pregnant at all and I think that I MIGHT be done with having babies, but I didn’t get my tubes tied or anything. I always said that I wanted to have 5 children, but now with having 4 under the age of 5, I think I am going to take a break. I am getting too old for this. And being that this pregnancy was not at all what I had expected – I am just tired and don’t want to go through that again for a long long time. Even though I am totally sleep depraved right now, I would not trade it for anything. I am LOVING the fact that I am NOT PREGNANT and I can finally get back to being ME again. 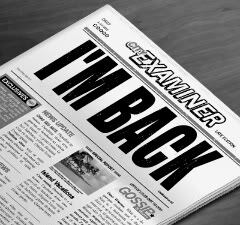 I have missed blogging and connecting with all of you. I am hoping to be back in full swing very soon with lots of great posts. Thanks for being patient with me.